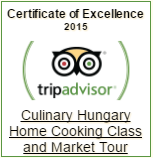 It is a true Hungarian classic, quite popular in the country. A delicious pie filled with sweetened shredded apple spiced with cinnamon and lemon. Mix the flour and the cubed margarine or butter by hand. The mixture will be quite crumbly. Add the whole egg, powdered sugar, salt, vanilla sugar, baking powder, sour cream, and lemon zest. Knead thoroughly. Add more flour if necessary. Divide the dough into 2 balls, cover and let rest for 20 minutes. Heat the oven to 180°C (355°F). Butter and flour your baking tin. On a floured surface roll out one part of the dough to the size of the baking tin (10×6), then lay it in. Sprinkle with half of the ground walnut. Spread the apples on the dough; sprinkle it with the remaining walnuts. Roll out the top crust and place over the apples, sealing the edges and making slits in it. Prick to allow vapor to escape, and brush with egg wash.
Bake the cake for 30 minutes, until the top is light-browned. Let it cool. 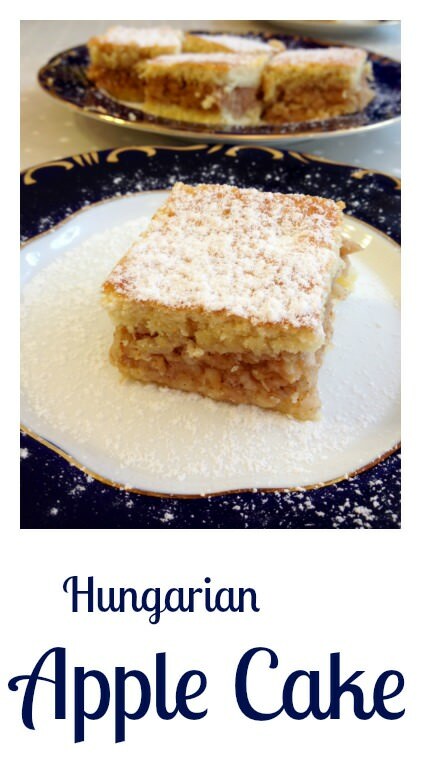 Cut into squares, sprinkle with powdered sugar, and serve. My G Grandparents and my Grandparents were born in Hungary, and my mother is the first descendant of Hungary and I am the second descendant. 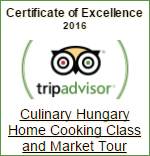 I want to learn more of Hungary. I still have some family over there. The cake came out delicious! I even put some sour cherries in it. I’m not sure what I did wrong, it was more like a pie consistency and I only used 4 apples yet it was too much… what did I do wrong??? What kind of apples did you use? I experienced that the best was Idared (bit sour but not too much). You do not indicate the size of the baking pan. What size do you recommend? I used 10×6 inch baking pan for this cake. What kind of flour is it? Cake, all purpose flour? It is all purpose flour.